Call for “Inclusiveness Target Countries (ITC) Conference Grants” now open! The e-MINDs call for “Inclusiveness Target Countries (ITC) Conference Grants” is now open. According to COST rules, only the following countries are entitled to apply to this ITC Conference Grants call: Bosnia and Herzegovina, Bulgaria, Croatia, Cyprus, Czech Republic, Estonia, fYR Macedonia, Hungary, Latvia, Lithuania, Luxembourg, Malta, Montenegro, Poland, Portugal, Romania, Serbia, Slovakia, Slovenia, and Turkey (see Vademecum). Conference Grants are exclusively reserved for PhD students and ECI’s with a primary affiliation in an institution located within an ITC. The applicant must make an oral / poster presentation at the conference in question and must be listed in the official event/conference programme. As proof, the applicant should attach the submitted abstract as well ast the letter of acceptance about the presentation. At the approved conference, the main subject of the oral / poster presentation must be on the topic of the e-MINDS COST Action and must acknowledge COST (see Section 10 of the Vademecum). Up to a maximum of EUR 160 per day can be justified for accommodation and meal expenses. Up to a maximum of EUR 500 can be claimed for the conference fees to be incurred by the selected Grantee. The ITC Conference Grant coordinator, Dr. David Culliton, assisted by Prof. Imre Bakonyi and Dr. Jelena Bajat, will perform the evaluation of each received ITC Conference Grant application. The process for selection of successful applicants will consider the scientific scope of the proposed participation and how it will support the e-MINDS COST Action in achieving its scientific objectives. The applicant must send their ITC application form submitted to e-COST (pdf) following form, the and send it by e-mail to david.culliton@itcarlow.ie with the subject “ITC Conference Grant application – COST Action e-MINDs”. 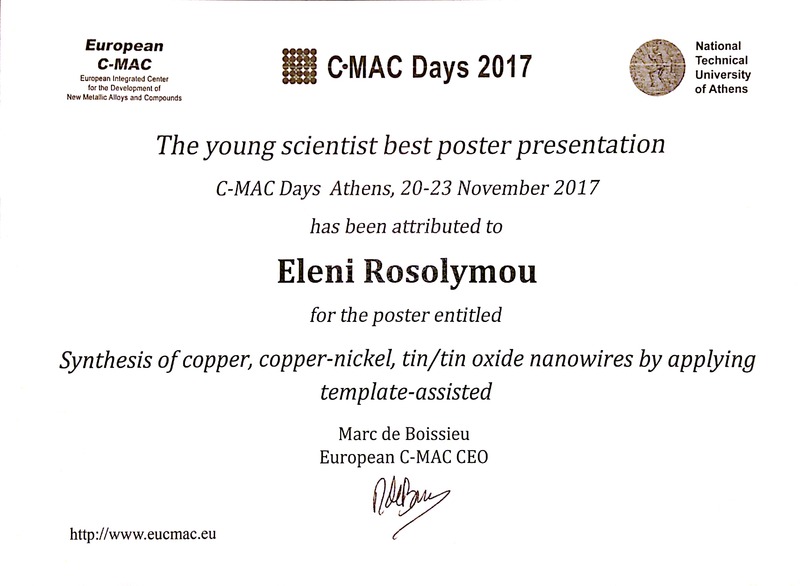 Eleni Rosolymou presented the poster entitled “Synthesis of copper,copper-nickel, tin/tin oxide nanowires by applying template-assisted” at the C-MAC Days 2017, Athens, Greece, 20 -23 November 2017, in the framework of Cost MP1407 and was awarded the “Young Scientist Best Poster Presentation Award”. Congratulations! ‘Ramón y Cajal’ Researcher at UAB and Vice Chair of e-Minds, Dr. Eva Pellicer, will present our Cost Action MP1407 at the upcoming EuroNanoForum in Riga, Latvia.